Risen from the ashes of a dwindling fire that once screamed rock n’ roll, Fireball Ministry will preach the Word of Rock to all who dare listen. With a heavy dose of fuzzy riffs, smooth vocals, and more hooks than a bait shop, this “First Church of Rock n’ Roll” is the only religion you’ll ever need. Signed to Bong Load Records as a two-piece (Rev. James A. Rota & Rev. Emily J. Burton) three months after their arrival in Los Angeles, Fireball Ministry has rounded out their line-up with bassist Janis Tanaka (L7) and drummer John Oreshnick (ex-Muzza Chunka). Their hard-hitting debut album “Ou’ Est La Rock?” produced by Doug Boehm, mixed by Tom Rothrock and Rob Schnapf (Fu Manchu, Beck, Toadies), featured guest appearances by Nick Menza (ex-Megadeth) and Guy Pinhas (ex-Obsessed, Goatsnake). Having received glowing reviews from Kerrang!, Metal Maniacs, Metal Hammer, Mean Streets Magazine, and CMJ online, the band was a hot ticket at the 1999 NXNW and 2000 SXSW music conferences. 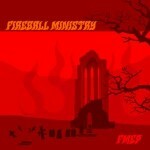 Described by Metal Hammer Magazine as “a witches’ brew of classic American rock ‘n’ roll,” Fireball Ministry has shared bills with Danzig, Fu Manchu, Nebula, Unida, The Atomic Bitchwax, Speedealer, Honky, Puny Human, and Raging Slab, and recently played the November to Dismember Metalfest.